I am Poornima Jadhav Kohly resident of Bhandup, Mumbai. I am free lance tutor. This is humble request to you for my mother’s medication. Being a married woman, in the process of helping my parents I am coming across a lot of limitations and pressure from all sides. My father is 83 yrs old and brain stroke patient…. My brother who is mental challenged had bacterial pneumonia last year and his lunges got affected.. He was on ventilator for 18 days. This incurred a lot of expense which was up to 10 lakh rupees. 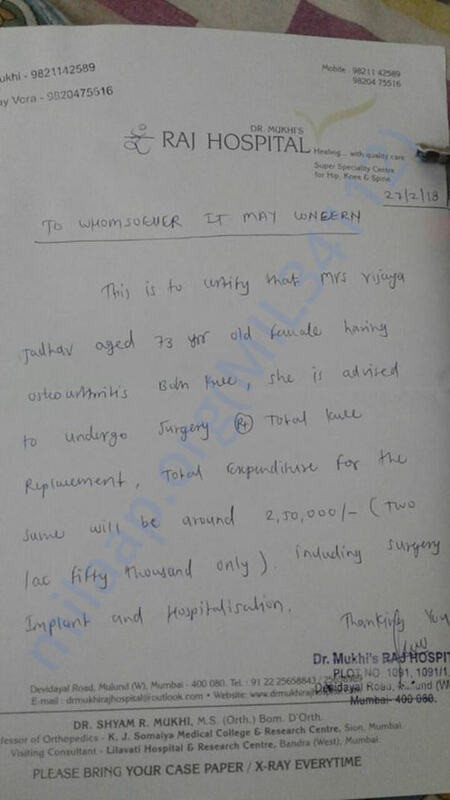 My mom had knee replacement surgery on 22nd March 2018 ….it was happened in an unusual condition. All my money was used for my brother’s wellness. We recently took discharge of my mother under shameful and humiliating circumstances and had to go through a lot of taunting and I am just so done with all this.. i have borrowed the money just to released my mom from hospital and now i have to repay it within mentioned period. today with great hopes I am asking everyone out there who can help me or even lend me money or make any kind of donation possible. It’s my word that who so ever gives me a loan, I will repay as soon as I get out of this trouble. It’s a genuine request which I am making and I really need help. I have all the bills… kindly go through with questions, queries and verification..